The things your mother – and my mother for that matter used to say may or may not all be the truth. Did you ever wonder about that? I really was never quite sure if it was OK to go out with wet hair or not or if holding my breath would really cure me of hiccups. Now I am a grandmother – so I don’t have to say things like my mom said to me – and if you want to know what being a grandmother means to me, just click on the link. You are probably thinking that I kind of missed a generation – and you are right. Did I say things that my mom said to me to my boys? I have to admit that I did – at least one of them. That is true. There have always been a good number of suggestions on how to cure this annoying thing, caused by spasms of your diaphragm. It was suggested to quickly drink cold water or standing on your head. But apparently holding your breath really does work. Another false one – apparently children have an amazing ability to adapt to blurred vision without experiencing eye strain. That as I’d, if you are noticing that your child is sitting too close to the TV all the time, it may be a sign that checks up with the optometrist and possibly a pair of glasses is needed. Personally, I don’t recall my mom saying that one, but if yours did, she was right. While showers do not actually attract lightning, if it does strike the plumbing system, it can be conducted into the tub or shower. Oh yes -this one is definitely true. It’s calcium and some good protein that milk will give you. In short, if you are not getting enough calcium, your body will take it out of your bones. Mother’s Day Wisdom – and have a good laugh! On that note – mom was right about a lot of things and showing love and appreciation on Mother’s Day (and every other day as well) is definitely the right thing to do! 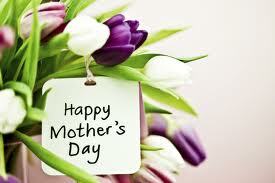 Happy Mother’s Day and lots of love to all wonderful moms out there!